The First Reformed Church was organized on September 26, 1833 in response to a petition drawn up on August 25, 1833 requesting the Classis of Bergen to form the church. Original meetings with Rev Ransford Wells engaged as a missionary were held in Presbyterian Churches and for a time above the Market Building at the corner of Market and Halsey Streets. Later this land was home to an opera house. Property was secured on the corner of Market and Beaver Streets. The cornerstone was laid on July 8, 1834 and the dedication was on May 6, 1835. The original brick front was replaced by a Romanesque facade in brownstone in 1857. 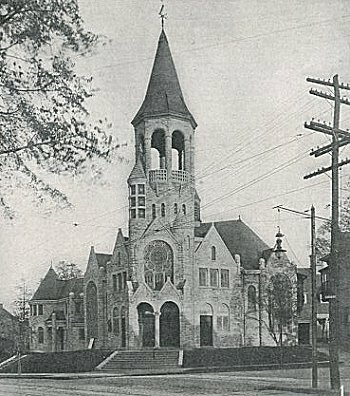 In 1893 the church moved to Clinton and Johnson Avenues. Today this church is known as the First Hispanic Reformed Church. Church gives material aid to its own poor, who are members, and to nonmembers with whom it is brought in contact, in the course of church work. Pastor is responsible for visiting in connection with church work.